AJ & Johnny’s wedding day couldn’t have been more perfect. It was a gorgeous fall day with pops of orange and yellow, and this sweet couple had long awaited their moment. AJ & Johnny have been together for years, and their patience made for a perfect wedding day. Friends and family started trickling in and the final touches were put onto the tables and lanterns in the trees. As AJ put her dress on and finished her makeup, the anticipation just built. We went out behind the chapel to a quiet area and allowed this gorgeous bride to see her groom for a few moments alone before starting photos. It was beautiful and special, and you just could feel them relax and begin to truly enjoy what this day meant to them. 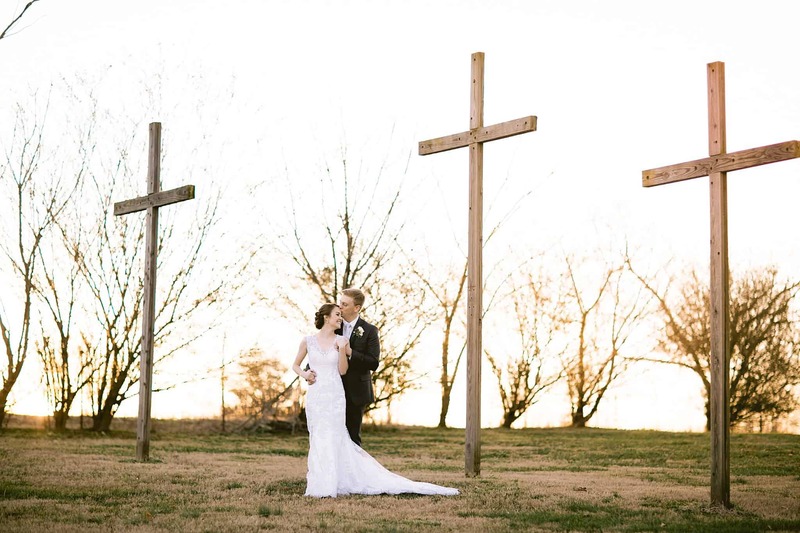 Their ceremony was at the Rosewood Inn in Jackson County, a gem of a place that’s almost like the area’s best-kept secret. After a moving ceremony as the sun went down, the couple treated their guests to dinner and a fun night of dancing. As the night turned cool and the fire pits heated up, the smell of campfire smoke filled the air, adding a feeling of comfort and goodness to this already wonderful day. We can’t tell you how special it was to be a part of this couple’s celebration. They are so fun to be around and such genuinely good-hearted people, and we are so happy for them as they embark on this journey of marriage! Right after their first look, Johnny presented AJ with her bouquet. On it, he had a special surprise – photos of her with her dad. What a special way to honor a lost loved one!